Flood situation at 7.30 this morning, showing major flooding moving down the Latrobe, Thomson, Macalister, Avon and Mitchell Rivers. The Latrobe, Thomson, Macalister and Avon Rivers emerge from mountainous country onto the flat plains to the west and north of Sale where they meander and converge through multiple channels before emptying into Lake Wellington, the large body of water SE of Stratford on the map. Lake Wellington is part of the Gippsland Lakes complex that lies behind Ninety Mile Beach, which is the long, smooth coastline to the SE of Stratford and Bairnsdale. The Avon enters Lake Wellington east of Stratford. The Mitchell, Nicholson and Tambo Rivers enter the Gippsland Lakes complex via Lake King to the SE of Bairnsdale. The only exit to Bass Strait for all these rivers and the Gippsland Lakes complex is a 150m wide channel at Lakes Entrance. The flood peak moving down the Latrobe came from torrential rain in Traralgon Creek, to the south of Traralgon, and strong flows from the Tanjil River to the northwest. Thomson Dam, in the upper reaches of the Thomson River, impounds the main water reservoir for Melbourne. Lake Glenmaggie is a major impoundment on the Macalister River, 15km west of Maffra. The Macalister meets the Thomson just northwest of Sale, which in turn flows into the Latrobe just south of Sale before entering tidal Lake Wellington. Rain eased across West Gippsland late this morning (see yesterday's report on rainfall for this event). However, falls of 150 to 300mm across West Gippsland, mostly within a 24-hour period, have produced river flows unseen since the 1990 or 1998 floods. In East Gippsland, rain increased as the second of the pair of East Coast Lows approached the SE corner of the continent. Rain fell through the day, with the highest falls of around 50 to 60mm causing renewed rises in East Gippsland streams. The map at right shows the main West Gippsland flood situation at 7.30 this morning, while the caption gives a quick summary of the layout of the rivers and Gippsland Lakes system which may help understanding of why floods in this area are complicated affairs. Flood levels in West Gippsland began to fall in mountain areas soon after rain eased. However, as river flows emerged onto the plains to the north and west of Sale and around Bairnsdale, it became clear that water volumes would equal or exceed the 1998 and 1990 floods on some rivers. Dozens of main roads became or remained closed today because of flooding, trees or powerlines across the road or landslips. 9,500 properties remained without power this morning, with the repair process slowed by blocked roads, atrocious weather conditions, and the need to give priority to fallen live wires. Latrobe River: Floodwaters entering the Latrobe from Traralgon Creek and Tanjil River gave river peaks just under minor flood level at Willow Grove, Thoms Bridge and Rosedale late this evening/early Friday morning. Several properties in Traralgon were under water from the flooding Traralgon Creek. Thomson River: Outflows from Cowwarr Weir exceeded major flood level (45,000 ML/Day) about 10.30 Wednesday night and peaked at 73,798 ML/Day around 4 or 5 this morning. At Wandocka, the river peaked at 6.74m around midday, just above major flood level (6.7m) but slightly below the flood peaks of floods of June 1978 and April 1990. The river started to rise at Sale early this afternoon and peaked at 4.23m around 5am Friday morning (major flood level is 4.0m). Macalister River: River gauges upstream of Lake Glenmaggie have been washed away, but major flooding occurred at Licola and moderate to major flooding elsewhere causing major damage in the upper Macalister valley. Bureau spokesman Ian Baker told ABC Radio "It's certainly looking as though it'll be the biggest flood we've recorded on the upper Macalister." Lake Glenmaggie has filled rapidly from low levels and began to spill late Wednesday evening. By 1.30 this morning outflow was already above the moderate flood level of 22,000 ML/Day. The outflow rate rose rapidly to a record peak of 147,000 ML/Day at 10am -- major flood level is 35,000 ML/Day! This is higher than the flows in the January 1971 flood event. The outflow rate did not drop below major flood level until about 8am Friday. Water flowed over the spillway with such force that it nearly demolished a power generating building near the base of the dam wall. The small settlement of Newry, on the flood plain 8km below Glenmaggie Dam, bore the brunt of the unexpected massive outflow. All roads to the settlement were closed and police used helicopters to winch residents to safety in addition to Zodiac boats brought in by Melbourne water police. Over 60 people were rescued from the settlement and outlying areas. Cows and horses were swept away in the Glenmaggie and Maffra areas, with 200 cattle lost on one property. Livestock loss and property damage are expected to be widespread. Avon River: The Avon peaked at The Channel at 9.30 yesterday evening at a height of 9.6m, well below the April 1990 flood peak of 11.22m. At the same time, the river exceeded major flood level at Stratford (6.5m) and rose rapidly to peak at 8.9m about 1am. The 1990 flood at Stratford peaked at 9.0m. The Princes Highway was blocked just north of Stratford with all practicable alternative roads flooded and only high-clearance vehicles allowed through. Stratford Caravan Park was evacuated last night along with about 40 residents from houses. Mitchell River: River gauges upstream from Glenaladale on both the Mitchell and Dargo Rivers have been washed away. At Glenaladale, the river peaked at 8.22m around midday (major flood level is 5.5m). At Bairnsdale, the river peaked overnight into Friday, with readings at the Pumphouse of 7.66m at 6pm today and 7.45m at 9am Friday and, apparently, no measurement of the peak. During April 1990 Bairnsdale Pumphouse peaked at 7.84 metres and during June 1998 at 7.75 metres. The Bairnsdale caravan park was evacuated this morning, and another 1220 people were reported being evacuated from homes. Bairnsdale residents were amazed to see a complete house, which had been in the process of being removed from a property, float down the river. The Princes Highway was cut. Nicholson River: No gauge data available, but flooding estimated to be moderate to major. Tambo River: By late afternoon, the Tambo was above moderate level and rising. Snowy River: Minor flooding was occurring along most of the river, with rises to moderate and, in some places, major flooding expected on Friday. Cann River: Both branches remained at minor flood level through the day. The West Branch peaked at 2.45m at Weeragua at midnight this evening. The East Branch peaked at 2.33 at Chandlers Creek at 11.45pm. Genoa River: remained at minor flood level. It peaked at The Gorge at 2.53m around 8.38pm. 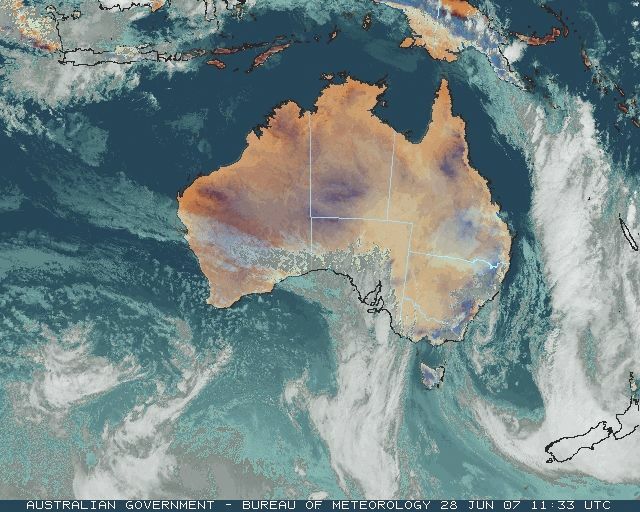 Somewhat overshadowed by events on the other side of the continent, WA's South West recorded general heavy rain overnight with the passage of a front. Jarrahwood's 76.6mm was its heaviest June one-day fall in 32 years. The highest official total was 83mm at Paynedale, 30km E of Busselton, though radio reports said some areas near Paynedale recorded over 100mm. 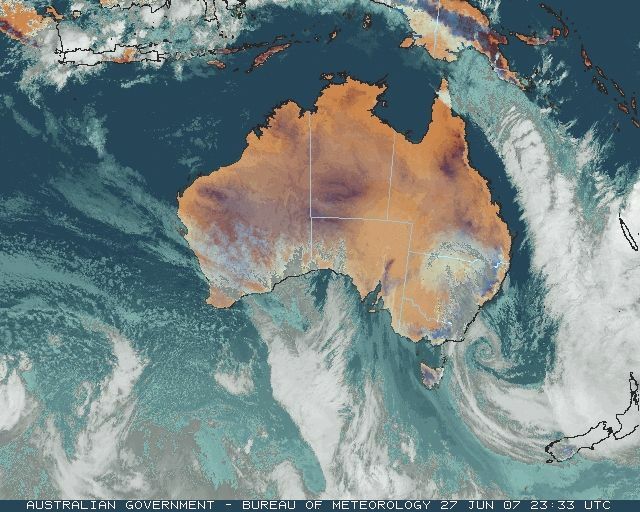 Totals of 10 to 25mm were recorded farther north along the coast to Carnarvon, and inland to the Great Southern. But the rain missed inland agricultural areas where farmers had been hoping for follow-up rain this week. Details in wettest and records. Temperature records high and low fell on either side of the continent today. 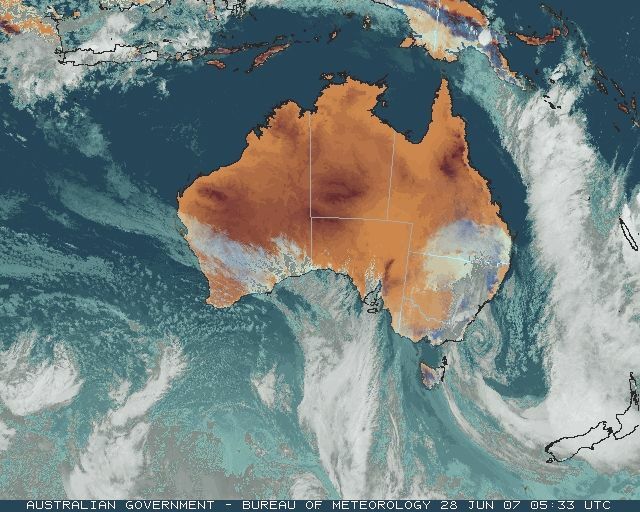 Kalbarri and Denham on the WA central coast set record high minima in warm northwesterlies ahead of the front that brought heavy rain farther south. 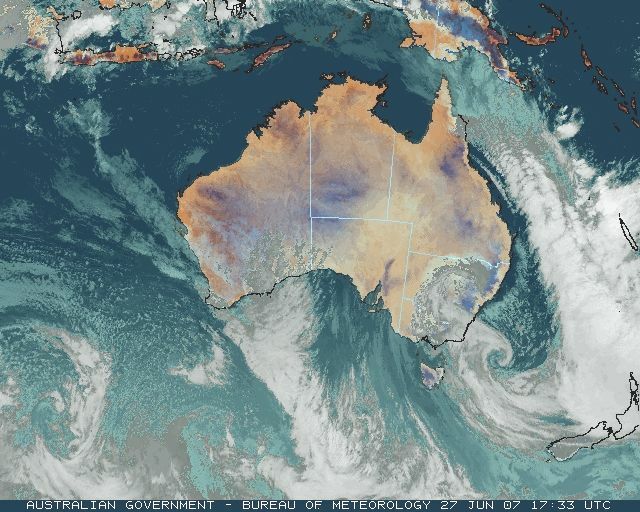 In QLD, cold air surging up from NSW set record low maxima on the Darling Downs and on the coast near Brisbane. Gladstone also recorded its coldest June night in 13 years. Details in records. These records are based on data received as at 0649 EST on 21/08/2008. Help in interpreting these statistics and information on quality control is here. 1 y Equal to record. 1 y Previous record set earlier this month.